For the third year, an innovative partnership in Syria is providing much needed warm clothing for the most vulnerable children in the northeastern Hasaka governorate. The winter kits produced by a UNICEF partner and a local association group, Al-Birr, include a winter jacket, woolen sweater, winter trousers, woolen hat, scarf and gloves, woolen socks, and winter boots. The clothes are produced using locally available cotton and wool for children up to 14 years. As part of the partnership with UNICEF, Al-Birr association has already produced a total of 5,000 winter kits this winter, distributed to Iraqi refugee children staying at Al- Hol camp, northeastern Syria. Another 5,000 kits will be produced for children in Kobane, rural Aleppo. The partnership has created an employment opportunity for 100 women, most of them having fled war in other parts of the country and are the sole breadwinners for their families. 40-year-old Maryam was forced to flee her home with her husband and 4 children when violence escalated in Idleb -northern Syria-, six years ago. 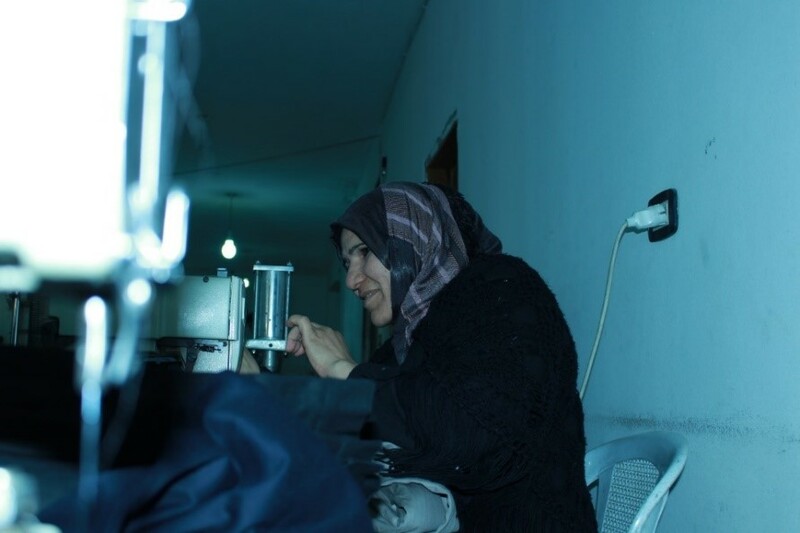 Mariam has been working eight hour-shifts at the UNICEF-supported workshop for the past three years. “With rising prices every day, every pound I make here helps towards providing my children’s needs, including healthcare, education, and even food,” said Maryam, whose son suffers from osteoporosis. Entisar, 42, was forced to flee her home with her husband and eight children five years ago, when violence escalated in Deir-ez-Zor. Having worked in the UNICEF-supported workshop for three years now, Entisar considers this project the family’s main source of income. “My salary keeps a roof over our heads so my husband can take care of our other needs,” she said. Kawthar, 47, was forced to flee her home with her husband and 9 children when violence escalated in Aleppo, almost 5 years ago. The family then settled in Qamishly, where Kawthar got a job working in the UNICEF-supported workshop to put bread on the table. “Only my eldest son has a job, but it’s impossible for our big family to survive on one pay check so I decided to work and carry the burden with him,” said Kawthar. When Shehaida’s husband was killed in shelling in Aleppo 4 years ago, she was left with nothing. The 30 year-old single mother then grabbed her two children and her disabled mother and headed to Qamishly, where she managed to find a job with the UNICEF-supported workshop. “Most of the women who work here are their family’s only breadwinner. If it wasn’t for this workshop, I wouldn’t have been able to provide for my children,” said Shehaida. 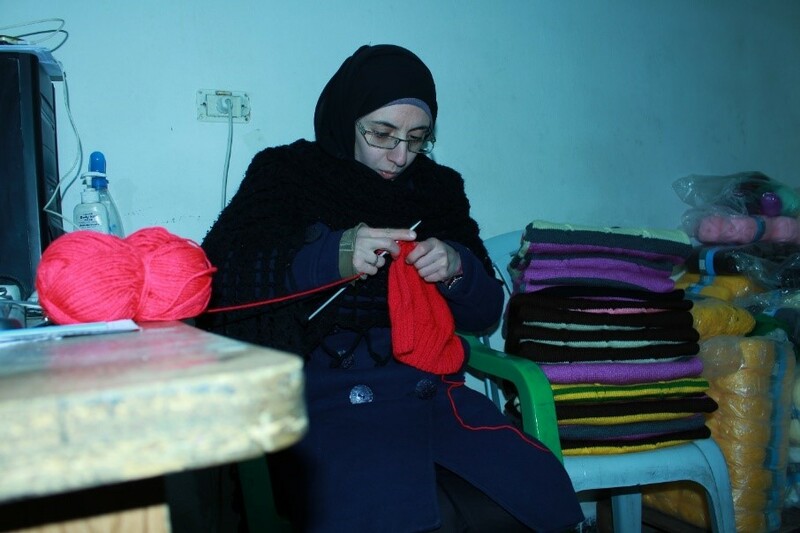 Mouna’s husband was killed in shelling in Homs almost five years ago, leaving her to care for their five children. Mouna, 47, settled with her children in Qamishly, where she started working in the UNICEF-supported workshop. Hala, 42, along with her four children and husband fled the city of Deir-ez-Zor in northeastern Syria when violence escalated almost five years ago. 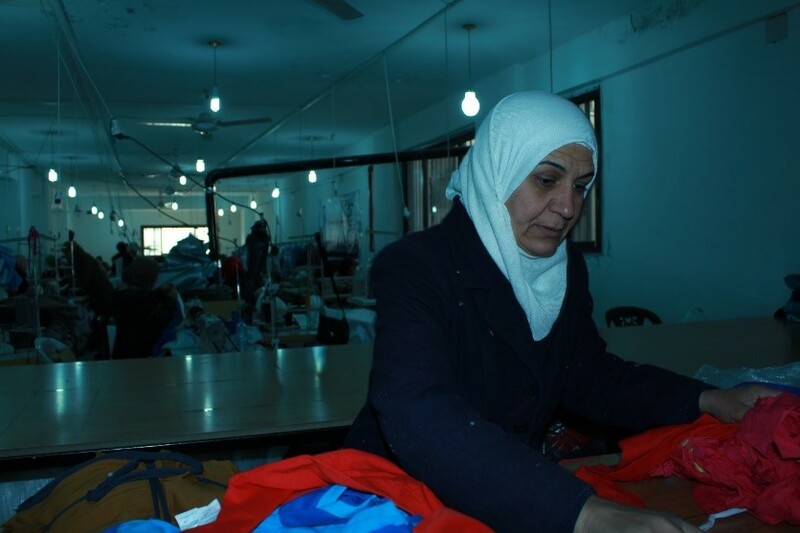 The family settled in Qamishly, where Hala was later able to get a job at the UNICEF-supported workshop. “My work here helps us pay rent for our house and get food and medicine for our children,” said Hala. Khawla, 47, takes pride in the work she does. 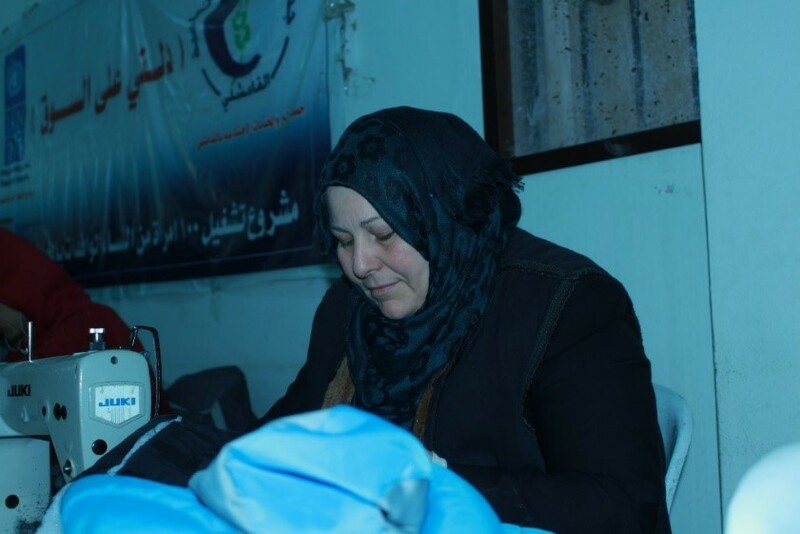 “Throughout six years of war, Syrian women proved that they’re able to withstand great suffering and support their men and their country,” she said while cutting fabric. “This job is very important to me, I feel useful. I support my husband and contribute to provide the needs of our five children. The women here work with passion and integrity, we make sure every piece that comes out of our hands is done perfectly, to put a smile on children’s faces,” she added. Manar, 31, together with her parents, sister and daughter fled the northeastern city of Deir-ez-Zor when her husband was killed almost five years ago and settled in Qamishly. 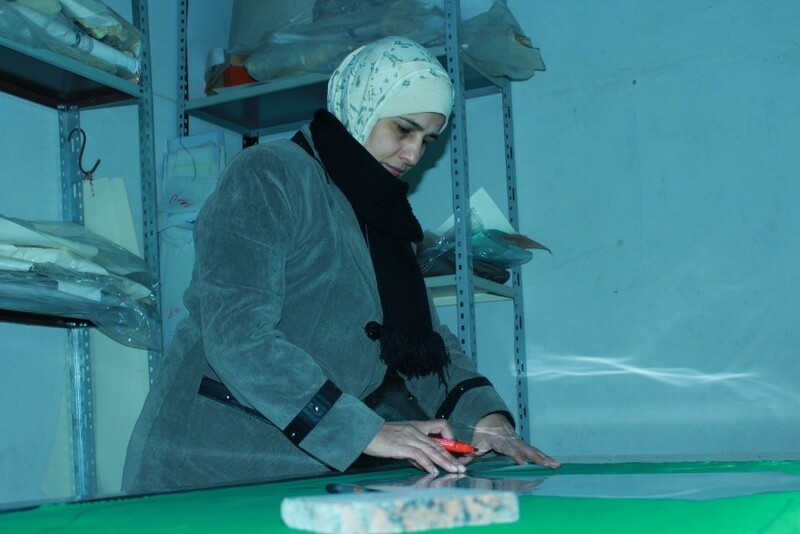 Manar’s job at the UNICEF-supported workshop is the only source of income for the family of five. “Our work here is all we have going in our lives, it’s how we express and support ourselves,” she said. 19 year-old Rasha attends classes towards her university degree in chemistry during the day, then works a shift at the UNICEF-supported workshop to support her family. Rasha, together with her parents and six siblings, fled their home in the northeastern city of Der-ez-Zor almost five years ago and settled in Qamishly. Rasha uses her salary to pay for her education, her sick mother’s medical bills and her siblings’ needs. “I like working here because it lets me meet new people and use my time and energy in something useful; supporting myself and my family,” said Rasha. “It also makes me happy knowing that a child will be warm tonight because of my work, I just wish I could see the look on the children’s faces when they receive the clothes,” she added. 20 year-old Amani is a student of education at the university. Every day after class, she works at the UNICEF-supported workshop to support her family. Together with her seven siblings and parents, Amani fled the northeastern city of Deir-ez-Zor almost five years ago and settled in Qamishly. “It’s a great job because I get to benefit my family and other children at the same time,” she said.